guy had to come home with me from a faraway nursery. Mr. Cherokee Purple, welcome to my windowsill. 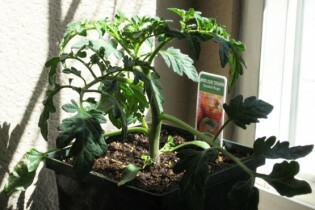 Most of my seeds have been purchased from www.sustainableseedco.com. 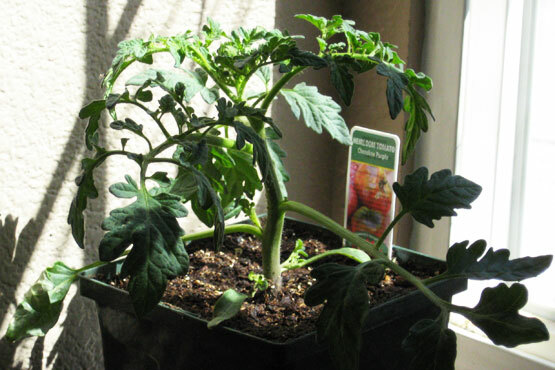 My heirloom tomato seeds arrived yesterday, so Mr. Pink Brandywine is now hanging out under the grow light, awaiting germination. 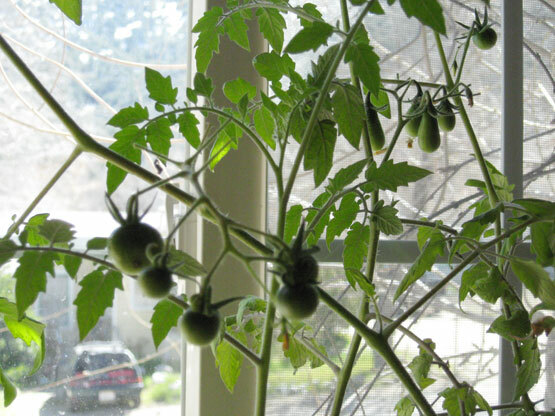 I have two other tomatoes that have been living in the windowsill for quite awhile now. They are a Sweet 100 and a Yellow Pear heirloom tomato. They’ve been growing like crazy, and got some well deserved organic fertilizer today. Looks like I’ll be tasting their fruits before they ever make it outside! What else did I do today? Let’s see… I planted Little Marvel Peas from seed, and got their curly-Q supports set up. A six pack of Black Kale was transplanted into the garden. (Speaking of black, I murdered a black widow. Better him than me!) I also planted a gourmet assortment of Lettuce seeds directly outside, and last but not least, potted up a pretty assortment of Chives, Oregano and Thyme.